Implementing OKR's (Objectives and Key Results) is a technique at work here at Axelerant. For us this ORK journey didn't start when we started using these for the first time this year. 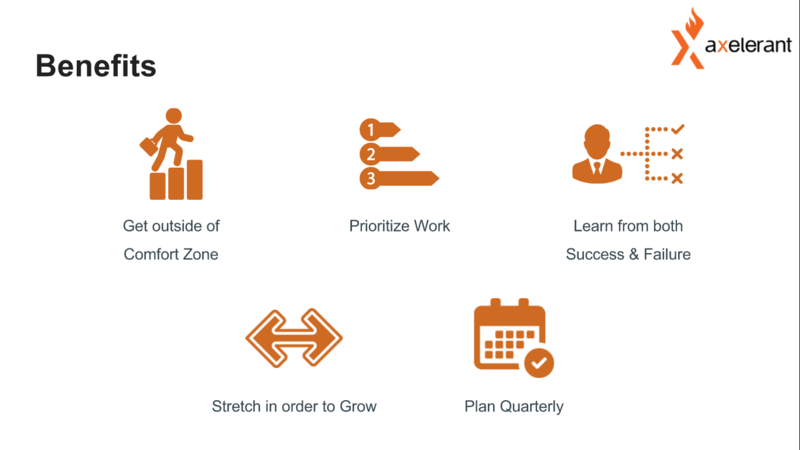 It started last year when we first decided to implement OKR goal setting across the organization. As a remote Open Source agency of over 50 strong, in business for over four years, it was time. OKR implementation made complete sense. We're a different kind of organisation and together we mobilize our people to put forward a considerable effort to short-term and long-term strategic objective alignment. So we decided to talk about this to our team members one-on-one. 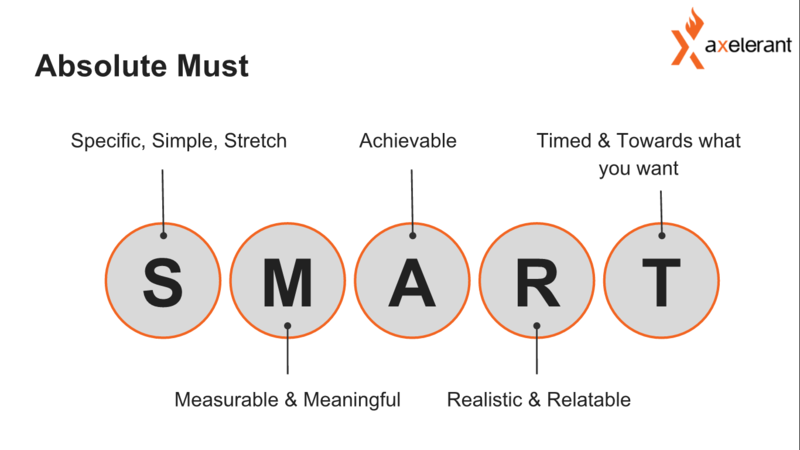 We discussed why goal setting is important, what are "Objective and Key Results," and how they can be useful for us to achieve greater success overall. 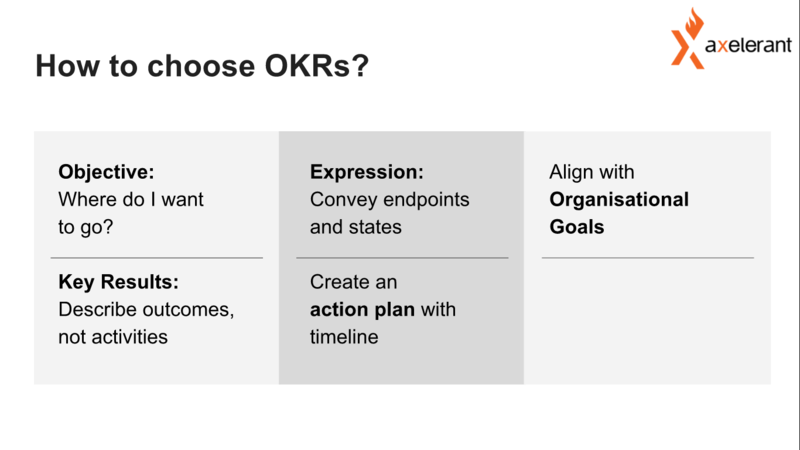 There was some hesitation giving this new OKR program a whirl—people were expecting rewards—they didn’t know how and where to fit these OKR's in their work and some were pretty skeptical. However, there was a larger number of people excited to stretch themselves, to learn, and to grow. From answering simple queries, to sharing the OKR success stories of companies like Intel and Google, the beginning was all roses. Then we had to get into discussing what kind of objectives they can take up. 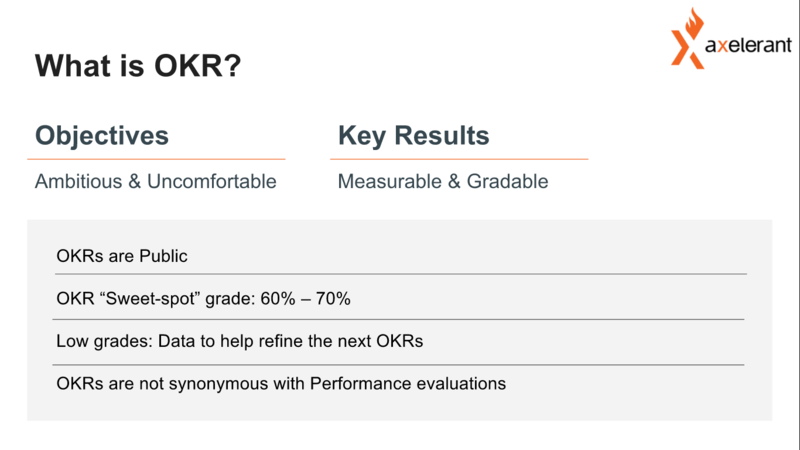 We had to make projections on how their "Key Results" would shape up, establishing placeholders to manage OKR's, etc. 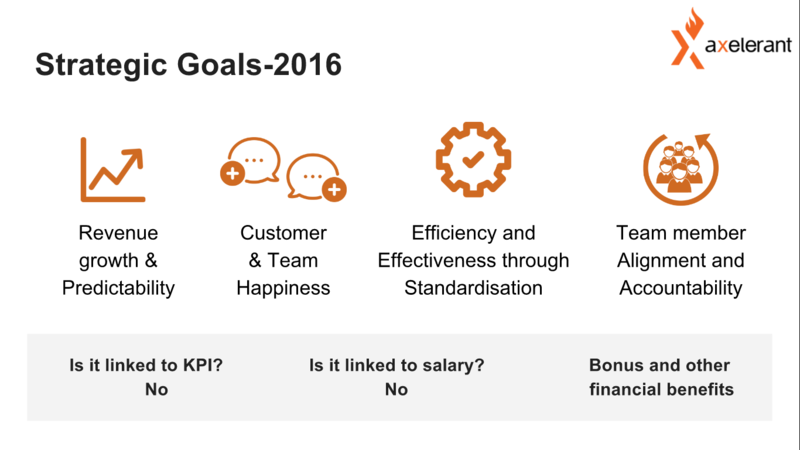 We took the first step in January 2016 to formally start setting up goals on a quarterly basis. We piloted the program within our Delivery Vertical, which has more Axelerant employees than anywhere else in our company—close to 35 people. From there, we took off. 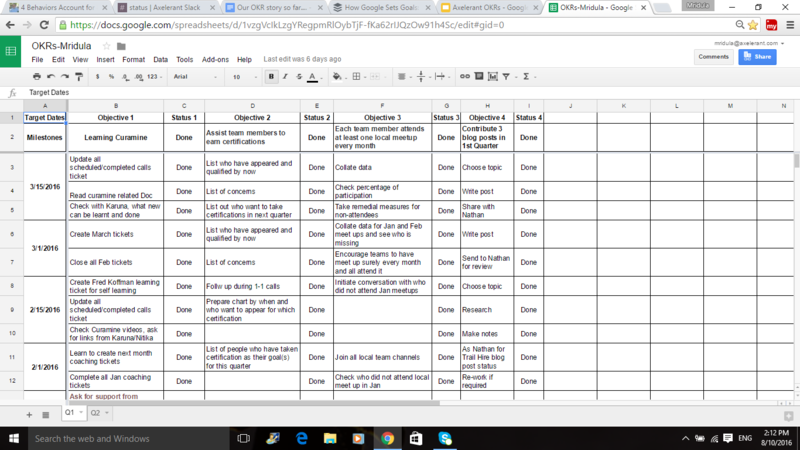 From kicking off, we shared a spreadsheet to make Axelerant's OKR program easy for team members to figure out. One of the sheets below indicates how OKR's look for different profiles. The second sheet contains information on how the organization wants to grow and what key results need to come to fruition to achieve this. 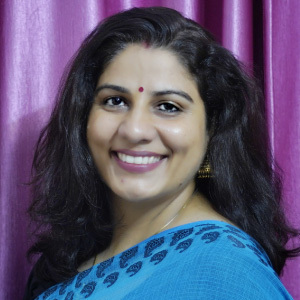 In one-on-one calls we started encouraging people to have a direct impact on Axelerant, including self-growth which happens to be a strategic objective for the organization too. Once goals were set, the challenge became defining these Key Results. Some of our employees wrote action plans within key results and that wasn’t leading us anywhere. So we engaged our Career Development Coach and our Managers to guide the team, defining what a Key Result is, how action item is not the key result, instead on focusing in on what the outcome. Being a service oriented organization, it was a real challenge for everyone to take up learning something as an objective and then showcasing the result in the same quarter. In the first quarter, it took almost all of January for everyone to bring their goals forward in a written format and their key results objectively specified. In the same quarter, many of us were traveling for DCA-Mumbai and had been involved for weeks in preparation. This also impacted the OKR program but when I see this retrospectively traveling didn’t impact us negatively; we were impacted because goals were set without a defined action plan to achieve them. To solve this we suggested a sample action plan, laced with milestone dates, to make this easier for each member of the team. 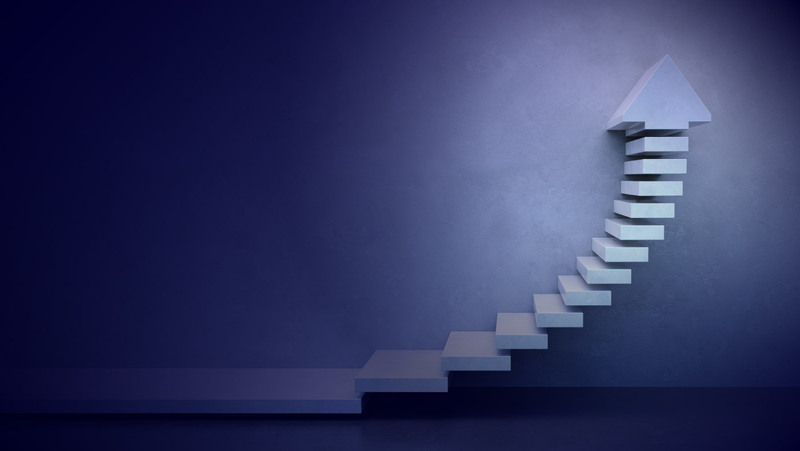 And since some team members weren't used to breaking these large goals into smaller goals, defining action items in advance, checking themselves on every milestone, was something different. As much as we tried to answer all these queries, we were on our way to more revelations. In our first quarter, our average goal achievability was 66%. But looking at it closely, we realized that maybe as a team we were playing in our comfort zone. People were selecting easy goals. We had to break the glass ceiling in order to grow and take selection seriosuly. 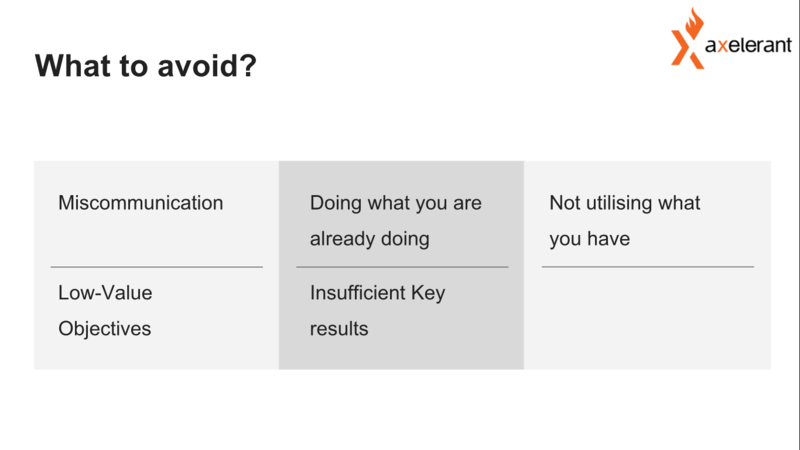 We looked at where we were going wrong and identified what not to do. From here we decided to spread the OKR program across the organization. Our goal was to forward a team of 48 strong people working towards growing together. We decided to make it optional though and some chose not to pursue the program. In this quarter 43 people took up goals to work on. We experimented with one more thing. During this organization-wide implementation, we asked people to choose two professional goals and one personal goal. The response was good, a large number of people picked up health goals, financial goals, some aimed to learn new skills or take up art projects—things like that. Professionally chosen goals was seriously ambitious. People broke their past patterns, embraced coaching to create new victories, took risks, and achieved new heights. In Q2 we achieved average goals at 60%. Goals which were far more serious and challenging. Now we're in Q3. This time we shared Organisational Objectives early, and everybody chose OKR's inside the parameters of strategic objectives. The small small steps from every employee ensured everybody contributing towards Axelerant's growth as a whole. Now we're a team of 48, choosing and working on their goals each quarter. Now Axelerant is looking and working in the same direction. This can open up huge possibilities for any company which experiences the synergy of collective efforts of the entire team, the whole system, working together. 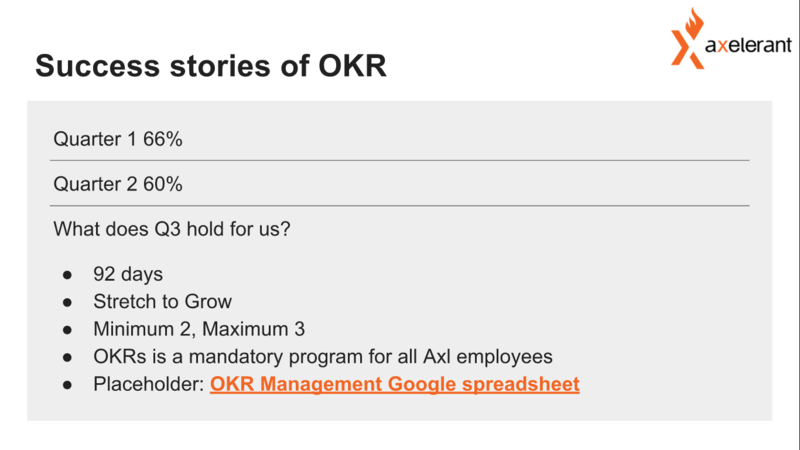 I'm glad we chose to grow with the help of OKR's. As a Life Coach I always say, choose a stretch goal. Working on it in a planned manner, defining key results properly, creating an action plan, checking yourself on due milestone dates—all of this. OKR's have a bigger purpose, an objective one. While working on our goals quarterly, we form positive habits and transform the organization.